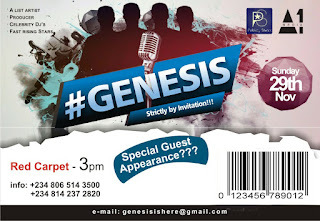 Publicity stunts presents GENESIS, it is a concert for strictly upcoming acts to sell themselves, to promote, to connect with their audience, believe in their dreams and most especially give themselves a shot, with the presence of A list acts, record labels, management companies and sponsors. 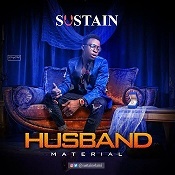 Cdq, Crush, Tobaloba, Ola dips, Masterkraft, Pepenazi, Brainee, Rtp, Durella, Slyde, Gabbybraun, Killertunes, Rocky, Vernom C, Ycee, T classic, Toby Grey, Young Tizzy, Ink Edwards, Galactic beatz and many more. 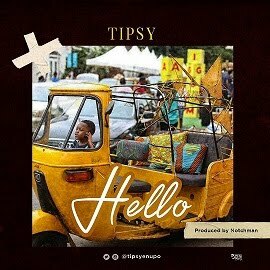 Pulse Ng|| Badboy Nation || JuiceHouse || Invaders Ent|| The Gang Ent || Prodigy Ent || Unilaggist.com || PANE NG || Perspective Changer || Olodo Nation || M.et.al || Kiss and Tell || Tudors NG || Extreme Ent || FAMOUS TV|| GOLDMYNE TV || PULSE TV|| NIGEZIE || WAP TV || KOGA TV || Hennessy || Sheynok Oil || Leila's place || Ruzu Channel || BME || Shaibu ventures. More info and sponsorship details call: 08142372820, 08065143500.